Life can be really hard sometimes, really amazing sometimes, uplifting, heartbreaking, thrilling, boring, lame, terrifying, sometimes . . . sometimes . . . sometimes . . . I saw this quote on Pinterest. Cliche? Maybe. 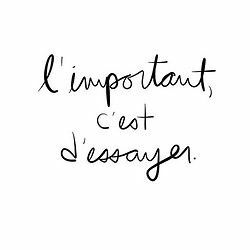 But it means, “The importance is in trying.” French, no less. I’m no expert in French, but the phrase is just so comforting. Anyways, I guess I’m just saying this: Keep trying. That’s what matters. It’s a good phrase for finding the motivation to plough ahead. Best wishes to you in your endeavours. really nice quote there. Thank you for sharing it.